Who has been eating my flowers? Just arrived in time for tea!!! Beautiful.....but noooooo.....they ate a lot of my roses a few years back...but I have managed to block their way in now...so watch out!!!!! It was nibbling that azalea!! Lovely photo .... regular visitor to your garden, Sticki? He seemed to be looking at me!! I havent seen him for about 3 years Shirley and then I saw him out of the window ~ not in the garden! If he keeps coming back Michaella I will have to make the fence higher? A great picture Sticki isnt he a handsome Boy!! thanks PP, i love his little face! I think he is fully grown but he looks quite young?? Very good snap! But what is it, Sticki? I do not know this animal. It has strange antlers. A very innocent look on it's face Sticky. How can you keep them out of your garden? Electric fence comes to mind but even then it would probably jump over it. I have no idea really how to keep them out linda ~ the garden is shady enough so i really wouldnt want to put up a bigger fence ~ maybe leave the OH outside on guard??? Oh Sticki , I know they look cute and I love to see them but not in the garden we have had to fence our garden in completely even then one managed to get in we chased it and it leaped over the fence easily .. they come right up to our gate ... apparently they are becoming such a nuisance they are talking of culling them all over the country to keep the numbers down ! The last one I saw was female, this is male ~ I wonder how many more there are round here!!! This one doesnt look too scared does he? Did you see the photo I put on some time ago Sticki ,it wasn't a bit scared we just stared at each other ! lovely animal ST & great photograph! we have them here but the fences are too high, the roe deer can & have jumped into the garden though. It's a beautiful animal but not one you want in your garden eating your precious plants! Hope you find a solution to keep him out! I dont suppose the cat will put him off!!!!!? thanks bampy! hmmmm pallet fences???? Not much growing the other side neellan, except for brambles? What do they like eating? The wood behind us is only small and we live on a busy road, its amazing how they suddenly appear. They like grass cuttings neellan? Im not sure about the shooting kat ~ farmers are allowed to shoot certain things here???? But certainly the escape is how they got to roam the countryside! thanks neellan ~ im going to look in a minute to see if he came back ~ with 4 inches of snow its easy to see footprints!! Oh wow Sticki, what a good pic of him too. Wouldn't last 2 seconds in my garden with the dogs. It's not good for dogs to chase these wee muntjac, they got sharp little horns and aren't afraid to use them! Snow has it's uses then Sticki!! Funny you should say there's nothing but brambles the other side Sticki because thats exactly what we have on the other side here, I think they like getting under the brambles where they feel safe they share with the hundreds of rabbits in the area .. have you heard them barking to each other like a dog ? ah yes neellan ~ it finds the culprits out!! Im not sure i had heard them amy but i might have just assumed it was a dog? i do hear foxes calling occasionally ~ they are quite spooky! i must look under the brambles more carefully next time i am up there amy! Welcome visitor or not, that's a great photo, Sticki! oh, Alice in Wonderland ~ mmmmm now that sounds like an interesting adventure!!! thanks Melchi ~ he stayed for a while ~ posing!!! whoa there!...LOL, that would give me a little scare if I found one of those in my yard...don't think I have to worry about anything like that here though. The oppossum was about the weirdest thing I've ever seen around here! He does look a bit like Bambi! But the amount of snow we now have I think it's maybe rudolf? He was too little to be scary floral, but I might have to scare him off another time or he will eat all the plants! Ooh, what a cute visitor! It's a shame they eat your roses. Lovely image. He is cute, I agree spenny, so far he hasn't had a go at my roses, I don't have many, I don't think it's sunny enough here. Thanks for the warning Pete, I will try not to get too close! :-) with a nice red currant sauce? It's a great picture and when I first spotted it I thought you had been down to the hide at Hiller's. I never knew there were any Munjacs around Bromsgrove. I thought I had problems with the garden at my previous house. This also backed onto woods and I was visited by Badgers that dug holes in my lawns. thanks delboy! no, this was taken from the shelter of my kitchen window!!! thanks for reminding me about hillers, its a while since i have been ~ will make a nice trip out! i think there maybe a badger sett in the woods and i did once see one in the garden but only once. plenty of moles digging their little hills around here too but i have never seen one. the garden is now covered in snow! I know it seems to be a nightmare a garden destroied by an wild animal. However I'd be more than happy having a small garden with such a lovely visitor... :o) don't shoot him. Could you plant something such a nice bush to feed him, giving a chance to your flowers, or he would prefer the flowers? "words of a balcony gardener which wildest animal are butterflies... "
If he has the same attitude as some of my less welcome visitors, he would always eat whatever I was trying to protect! But if he were coming to my garden, I would be delighted while crying for my plants at the same time! I loved seeing him Aleyna, I wouldn't shoot him ( I don't have a gun anyway!) I don't mind a few flowers being eaten, like you melchi, I was delighted, but I might be sad if he ate or trampled on everything! very cute, thanks, Elizabay, not seen him since though! Well, perhaps that's for the best - you welcomed him, you have the photo and maybe he'll leave your flowers alone! been there, done that and got the t-shirt type scenario melchi? still snow over most of the garden today! I think he's beautiful, I've never seen one so it was great to view your pic. 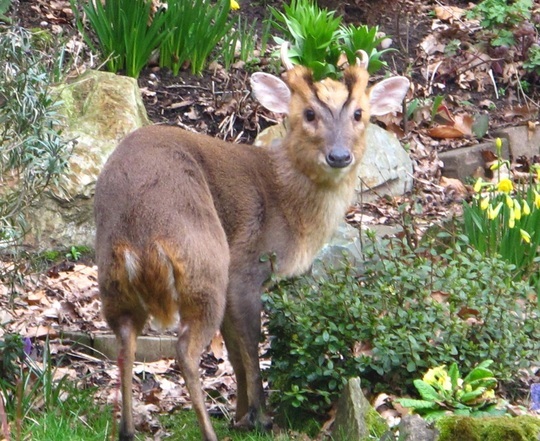 We have roe deer around Godalming in the fields but never in the gdns( hope I 'm not tempting providence by saying that). I'd hate to have anything eating my plants. I do sometimes have problems with moles tho'. thanks feverfew, i like him too! perhaps roe deer don't go in gardens? this one didn't seem very shy but maybe some species are more timid? i wonder if it doesn't live in the woods behind but had walked down from the Lickey Hills, so maybe he wont visit the garden again? lots of moles seem to go along the verge by the road but so far not in the back garden? There's an unpleasant solution, Sticki. Lion dung or urine, I kid you not! They only need one whiff & your problem is solved. Hmmmm used to live near Woburn abbey (who do have lions) but nearest zoo is now maybe 20 miles away? Don't suppose dandelions would do instead? I know I said in an earlier comment that I would probably never see anything like that in my yard but...I was on Facebook earlier today & a friend asked me if I had seen the deer in front of the community center down the street from me! I hadn't even heard about it but he told me he saw it on the news! Have to have a web cam on the street -to pick up the wildlife! If he was that near maybe he will visit you? Someone probably picked him up? They would have called Ojibway Park to let them know. They figure that with all the work being done in the park area that they are disturbing the wildlife & it wandered down the railway tracks. It would have come clear across the city somehow...boggles my mind how no one saw it crossing the side streets! Looks like a huge road system but then I expect our roads would look tiny to you! it is amazing that wildlife can move around seemingly unseen?? too bad it's being built so close to a nature reserve area...not like the animals all stay within the boundaries...I still wonder how it made it over this far, crossed all the streets while there was no traffic? It crossed some very busy roads if it did come from there. I went on google earth to see Worchestershire! Oh my gosh, it so different from Windsor, Ontario!!!! Folk probably did see, Floral, but were to bemused. oh ok, so next best thing ~ i have a cat ~ does that count? I s'pose you could chuck it at the deer. Lol. Something has nibbled the tips off several bulbs but I think that's more likely to be the pigeons? They would be more worried by the cat! Paws for concern - very good! wish i had a powerful water pistol!!! Try a catapult or pea-shooter. Never know 'til you try. Tee-hee. Wonder how good my aim is?